This morning, 27 Oct 2009, for the first time in 30 years I didn't glance in our barnyard to check on Bonnie. Nor was I greeted by her soft nicker when I went outside. It was a gray morning with new snow on the ground, but there were no tracks from the night pasture to her favorite spot by the gate where she would wait patiently for her breakfast of "Equine Senior." Last night I woke up a couple of times, and by habit looked out our bedroom window to see if I could spot her silhouette in the moonlit field before I remembered: Yesterday it was obvious that more procedures and treatments would not save her failing health and would only increase and prolong her discomfort. And Bonnie departed this world and this period of her life into a Continuity between Nature and Grace that I can hardly imagine. But if I believe that, and I think I do, why does it hurt so much tonight? Thirty years ago my wife Laurie, our 12 year old daughter Denise, and I went to a neighbor's place to look at a beautiful 10 month old Morgan/quarter horse filly. 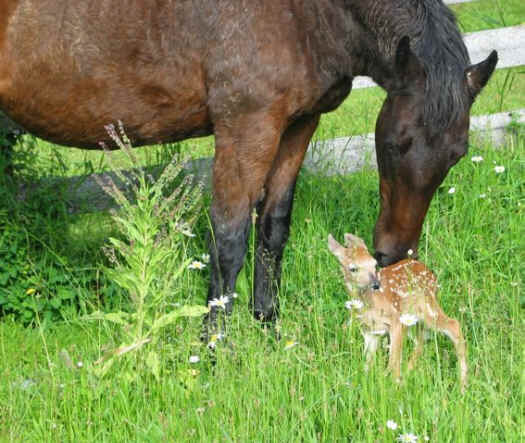 We decided she would be the horse for our daughter, and we brought her home to our farm where she would live her entire life. For six years Denise and Bonnie were best friends. If we needed to find Denise, we could count on her being in the barn brushing Bonnie. On a snowy February morning when Denise was 18 years old, she died in a car accident on the way home from the Community College. All of our lives changed forever...and Bonnie became our living link to our daughter. With age Bonnie mellowed and became sweeter and sweeter in disposition. She was the most affectionate horse I have ever known. She would have come in our house if she could of found a way to negotiate the front porch steps. 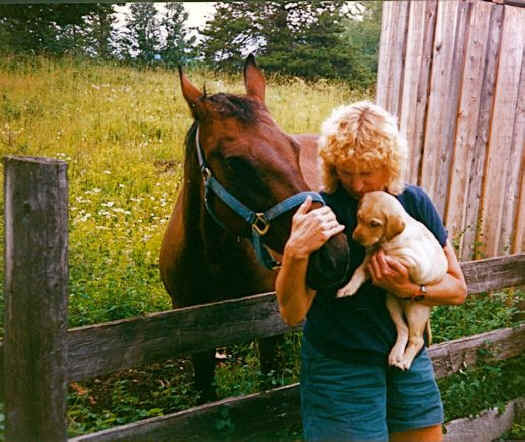 This photo is of my wife introducing our yellow lab, Nahanni, to Bonnie 13 years ago. Nahanni is still with us. In fact she is asleep on the couch in front of the wood stove as I type this. Bonnie loved to be hosed down with cold water on hot summer days. I worried about her during sub-zero blizzards as she got older, and I had just built her an insulated and heated stall. She never got to use it. I will close with one story about Bonnie. Several years ago we had a coyote den at the edge of our field and raise one pup successfully. They stayed around that spring because we had an abundant supply of ground squirrels in the field. During the first week of June, I happened to be looking out the kitchen window and noticed a whitetail doe giving birth in the barnyard. The coyotes noticed also and were intent on getting the fawn. One coyote was trying to distract the doe and get it to chase her while her pup was circling around from behind. I raced out to "interfere" with nature, but before I could get there, Bonnie saw what was happening and went and stood over the fawn to protect it. The coyotes gave up and moved on when they saw Bonnie protecting the fawn. The doe was exhausted and was content to let Bonnie nudge the fawn to a standing position and clean it. 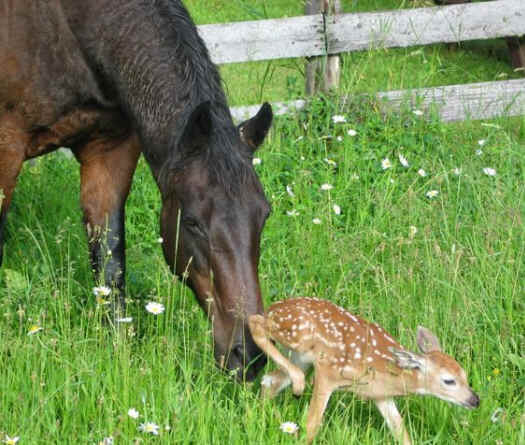 Eventually the fawn followed its mother through the fence while Bonnie hung her head over the fence and nickered plaintively. Thank you for listening. I miss Bonnie more than I can put in words...but it helps to try.